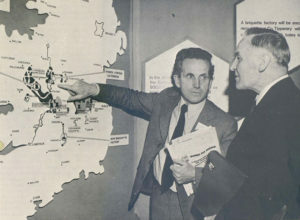 When the serious threat to this country’s fuel supply resulting from restrictions in the flow of Arab oil became apparent last autumn, Bord na Móna carried out a re-examination of bog areas which had previously been considered incapable of economic development in the face of low cost imported fuels. As a result of this re-examination of our bog resources a third turf development programme has been formulated. The Board considers that, in the new energy situation, large additional quantities of peat fuel can be produced economically for electricity generation and for industrial and domestic use and it has advised the Minister for Transport and Power accordingly. The Board’s initial development programme, adopted in 1946, had as its main features the production of 1,000,000 tons of sod peat annually, improvements in the Lullymore briquetting plant and the establishment of the first generation of turf fired power stations. Its second development programme, launched in 1950, concentrated chiefly on the milled peat method of production and since that date the annual milled peat output has been built up to 3,000,000 tons. The success of this programme led to the erection of four additional peat fired power stations and two new major briquette factories. 150,000 tons of sod peat. Continuous all the year round employment will be provided for an additional 1,500 men rising to about 1,900 during the peak production season. The capitol cost of the new programme, involving the drainage and equipment of the selected bog areas, is estimated at £20,000,000. It seems likely at this stage that the additional peat supplies which will become available from this expansion will be sufficient to sustain new generating plant in the range of 160 M.W. capable of producing 700,000,000 units of electricity annually. The Electricity Supply Board has welcomed the additional quantities of peat which Bord na Móna will be in a position to supply and joint discussions are already taking place on an agreed plan for peat utilization on a much increased scale. When these discussions are completed, the two Boards will submit their proposals to the Minister for Transport and Power for approval. It will take about five years to bring the new bogs into full production and to construct the new electricity generating plant. The main development will be located west of the Shannon in the Athlone-Shannonbridge and the Ballinasloe-Castlerea areas where 900,000 tons of milled peat will be produced in newly developed bogs to supply 120 M.W. of new generating plant. An extra 280,000 tons of milled peat, which is sufficient to sustain 40 M.W. of generating plant, will be produced in the Lanesboro region. In new areas of bog in Co. Offaly, 200,000 tons of milled peat will be produced at Derrygreenagh and 150,000 tons at Boora to increase the output and extend the life of Rhode and Ferbane power stations respectively. On completion of the third programme the total capacity of all the peat fired power stations will be 587 M.W. representing an increase of 37% on present capacity. Annual consumption for electricity production at that stage will be 3,600,000 tons of milled peat and 500,000 tons of sod peat giving an output of 2,400 million units of electricity. Apart from hydro, the peat fired power stations now produce the cheapest electricity in the E.S.B. system and there is every indication that peat will retain its competitive advantage in the years ahead. Solid fuel production is also to be expanded. 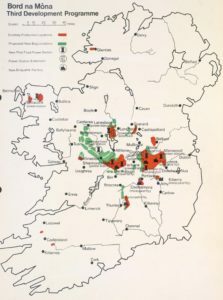 The Board proposes to erect a fourth briquette factory near Littleton, Co. Tipperary, with a capacity of 5,500,000 bales a year using milled peat supplied from new bogs to be developed in that area. An additional 150,000 tons of sod peat will be produced for the commercial market in areas adjoining existing Bord na Móna centres in Cos. Kildare, Longford, Westmeath, Meath and Galway. To meet the rising demand for sod peat in pre-packed form additional polyturf units will be erected. About 25% of the milled peat will be converted into briquettes giving a total briquette output of 34,000,000 bales annually. The saving in fuel imports which will be effected at this level of peat production is estimated at £50,000,000 a year at today’ prices and in heating value it would be roughly equivalent to 2,000,000 tons of coal. All the year round employment by Bord na Móna will then be 5,600 men augmented by another l,300 men during the production season. Progress in bog development has been hampered in recent years under pressure from low cost imported fuels and Bord na Móna welcomes the opportunity now presented to it to embark on a major expansion. Work has already begun in investigating the potential of bog area not included in the new development programme to ensure that the long term problems facing this country as a result of the energy crisis will be minimized by the fullest possible utilization of our peat resources.